With its 115 stylish suites and guestrooms, the Holiday Inn Express & Suites Ottawa West Nepean offers all the convenience and amenities you want with the Holiday Inn Express name you trust. 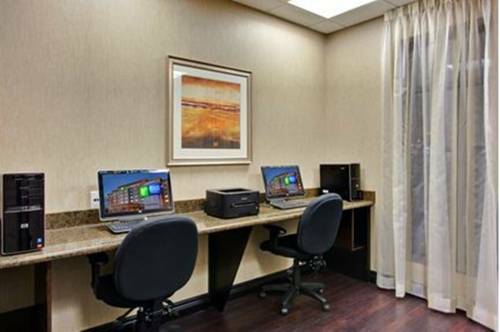 Your stay includes free high-speed Wi-Fi and a free Express Start Breakfast served daily. Whether youre visiting Ottawa's west end for business or leisure, the hotels ideal location off Highway 417, puts you minutes from downtown Ottawa, the Bayshore Shopping Centre, IKEA, the Canadian Tire Centre, DND HQ - Carling Campus and the Ottawa MacDonald-Cartier International Airport. Fall is a great time to visit Ottawa! Visit the Diefenbunker museum or drive to Gatineau Park and go cross-country skiing on one of their many trails. Whatever your preference, our hotel puts you where you need to be. Please note: When using your GPS device to navigate to the hotel, please use the previous street address for the hotel of 45 Robertson Road or use the cross streets of Moodie Drive and Robertson Road. Childrens's program - The hotel is located within 10 minutes driving from Funhaven, Ottawa's premiere family entertainment centre with attractions and events for all ages! Trinity: Host your corporate business meeting, company conference or training session at Holiday Inn Express & Suites. Our Trinity Room offers a 52" LCD Television and access to our outdoor patio. Stonebridge Golf and Country clubEnjoy a round of golf with colleagues or with your family. A PUTT ABOVE is the place to be on a rainy day. Just a 10 minute walk from the hotel. Bruce PitThroughout the year, you can let your dog run free at the Bruce Pit, part of NCC's Greenbelt. In winter season Bruce Pit also offers excellent tobogganing hills. Canadian Tire CentreCanadian Tire Centre is a multi-purpose indoor arena in Ottawa, Ontario, Canada, located in the western suburb of Kanata. Take in a concert or see the Ottawa Senators play.